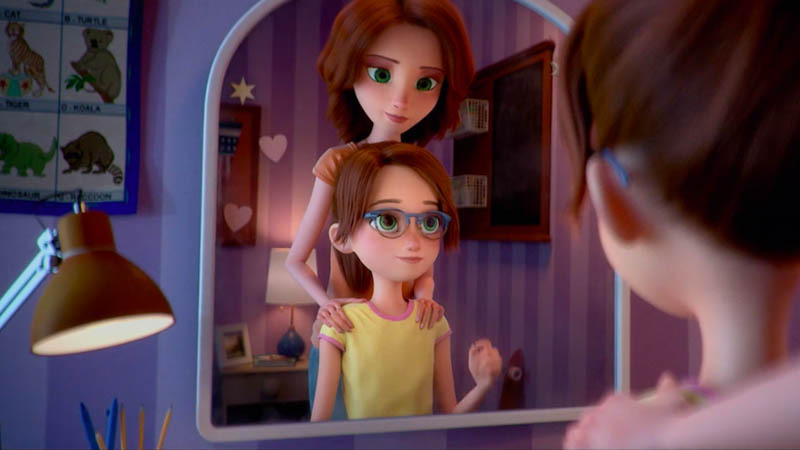 Carbon teamed with Golin to design, direct, and produce a fully cgi-animated cinema-release campaign for optics company Essilor, aiming to create a meaningful and emotional piece encouraging parents to recognize the signs of myopia in children. Despite a limited schedule Carbon team focused squarely on the benchmark for character-driven emotional cgi storytelling, Pixar’s famously eye-misting Up, and for character styling they looked at modern classics, Despicable Me and Inside Out. Carbon CD Liam Chapple was keen to get stuck into such a creative concept: ‘This is exactly the kind of creative brief we hope to receive because we love to be involved from the inception of the story and early concept development and storyboarding, all the way through animatics, edit, and look development to the final image and sound design. The storytelling element of the film gave us the opportunity to push the research stage, exploring the backstories of the film’s protagonist Mia along with the extended cast, expanding on character development both visually and from a personality standpoint, which in turn gives motives for the action. Given the freedom to explore every aspect of character and environment design, team had to find unique and efficient ways to quickly translate them into a CG world. A large team of artists, across Carbon’s Chicago and New York studios, worked within Carbon’s proprietary pipeline to achieve everything from character modeling to complex season-driven dynamics in-house. Creative Director Liam Chapple saw the value in dynamic hair systems, so they employed the Ornatirix plugin and Vray for Maya for styling and simulations, and they added richness and interest to the exteriors by populating our parks and lawns with fully-animated trees using SpeedTree and Forest Pack, and falling leaves using ncloth. The final compositing touches and beauty work were added by our Nuke team, and color grade was set by the talented hands of our Chicago colorist, Julien Biard.